Five hundred and eighty-five years ago today, Jehanne d’Arc led the French army under John of Dunois in the taking of the Tourelles, the heavily fortified and turreted gatehouse at the southern end of the bridge that led over the Loire river and into the besieged city of Orléans. She was seventeen years old. It’s an amazing episode both in Jehanne’s own story and the Hundred Years War itself – her first major military victory and a turning point in the war. The six-month siege itself was lifted on the 8th, and to this day, Jehanne bears the name La Pucelle d’Orléans – “The Maid of Orléans”. 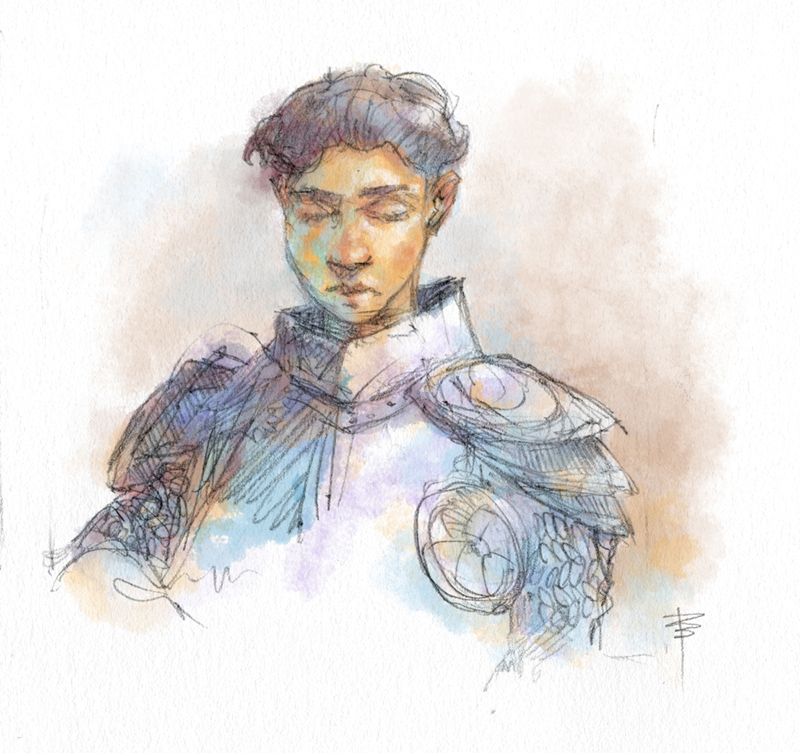 To honour the date this year, here’s a graphite and digital watercolour sketch I made of Jehanne last summer. I wasn’t concerned as I usually am about being historically correct in the details of her armour – I just wanted to be free to sketch out a mood, and I quite liked the result. I just wanted to help spread the news that Jon Schindehette’s INSPIRED book project is about to hit the streets! 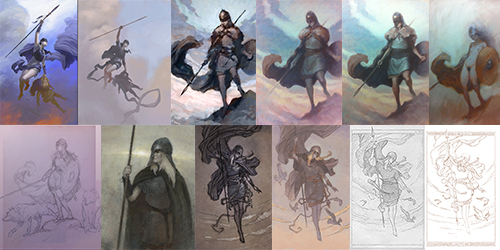 The jury for this project was a wonderful all-star line-up: Irene Gallo, Julie Bell, Lauren Panepinto, Rebecca Guay, Terese Nielsen and Terryl Whitlatch. 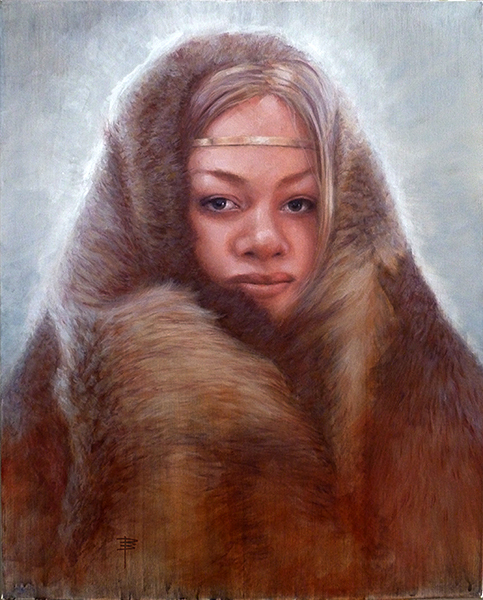 The artist list is as follows: Alice Cao, Anthony Schmidt, Ashley Stewart, Boco, Brenda Lyons, Cole Marchetti, Cristina Bencina, Dave Lebow, David Brasgalla, Elizabeth Leggett, Filippo “onez” Vanzo, Gabriella Liv Eriksson, Herman Lau, Inaya Hodeib, Jason Cheeseman-Meyer, Jim Zaccaria, John Picacio, Julia Metzger, Julian Hayduk, Kelley McMorris, Kip Ayers, Kiri Østergaard Leonard, Kristina Carroll, Marc Scheff, Paul Pederson, Rebecca Yanovskaya, Rich Klink, Sam Guay, Sybiline, Tara Larsen Chang, Tav Kong, Terese Nielsen, Terryl Whitlatch, Wylie Beckert. This is a 132-page paperback with a limited print run of 1000 copies, so don’t wait to order if you’d like one. If you take part in the pre-order before April 3rd, you get a free digital copy of the book in PDF form. I’m very pleased and honoured to have been included in this project, and I want to do my part to help the project succeed. Please take a look at the Art Order store page and help support this new publishing model for artists! And thanks, Jon, for all your hard work making this project happen – I know it’s not easy! This piece was created for issue 119 of ImagineFX magazine. 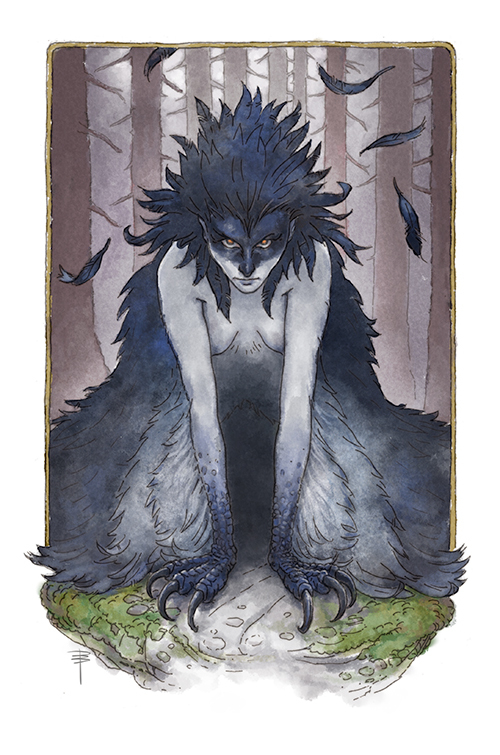 A vildvittra is a swedish variant of a harpy, although much smaller. They feature in Astrid Lindgren’s classic 1981 childrens’ book, Ronja Rövardotter (Ronja Robbersdaughter). My version is slightly different, with the beak only implied by the facial colours. I realise now that I probably should have included some elements that gave the scale, but I still like how this turned out. Thanks to Elin Hökby for the original suggestion to depict this woodland creature! So far, there’s been a lot going on for me in 2014 in all respects, but I’ve managed to keep it all together for the most part. The first priority of the year was to look at my work from 2013 and pick the pieces I feel are worthy to send to the Spectrum annual. This past year I seem to have stumbled into a kind of style without quite meaning to – pencil/ink illustrations with digital colour. I realised that most of what I’d want to submit this year came from this one direction I explored, and they seemed to hang together well. My 2013 Spectrum Annual submissions. Winter VI – 60x50cm, acrylic on canvas. John Wheeldon – acrylic on canvas. 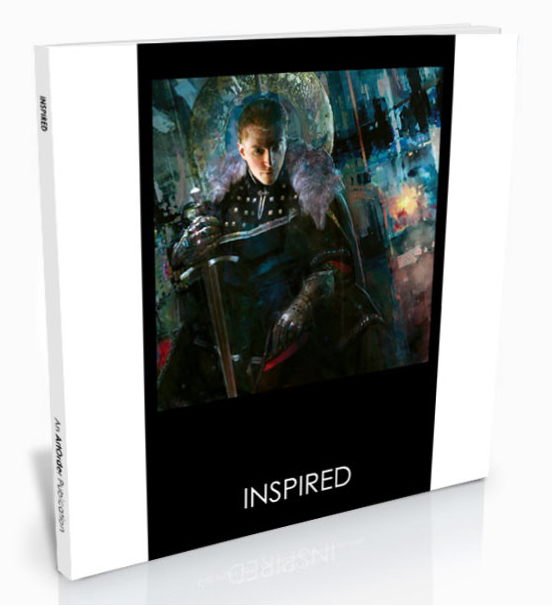 I’m very pleased that Valkyrjan IV was selected by the jury for inclusion in Jon Schindehette‘s upcoming Inspiration book project. 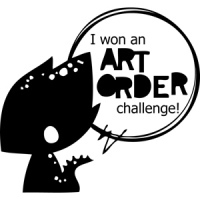 It’s very exciting for me as the jury was composed of some of the top artists and art directors working in fantasy and science fiction publishing today – not to mention that the challenge submissions were filled with wonderful and strong work from all quarters! I’m somewhat surprised to find myself in such company. I always imagine that my personal art sensibilities are a bit arcane and old-fashioned. 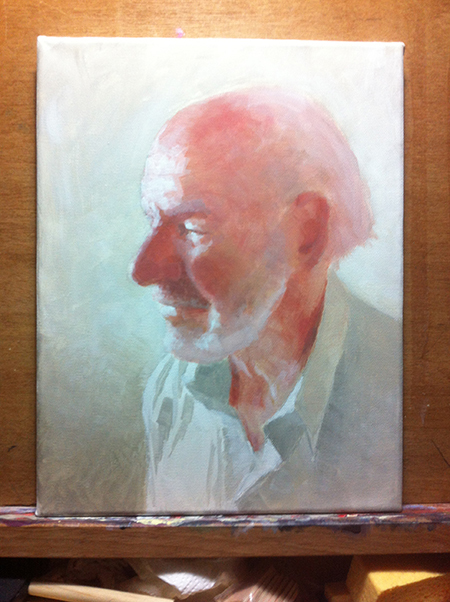 It’s a nice validation of the piece, I think – one that I’ve laboured over for years, trying to find the right way in. I had an idea for a darker, more “historical” treatment of a valkyrie about four years ago, and my first attempt was with ArtRage and a Wacom tablet in January 2010. Soon after that, I started using an iPad for my painting (which I much preferred). I came up with an improved version that I was happy with at the time, but I eventually felt dissatisfied again. The idea stayed on the back burner until Northern Light Workshop 2, where I decided to take some digital sketches and try to execute the final in acrylic on paper. I think it worked out pretty well considering how rusty I felt with analog painting, and both the instructors and my fellow classmates were very encouraging to me about the picture. Still: not satisfied. A “short” history of Valkyrjan IV. 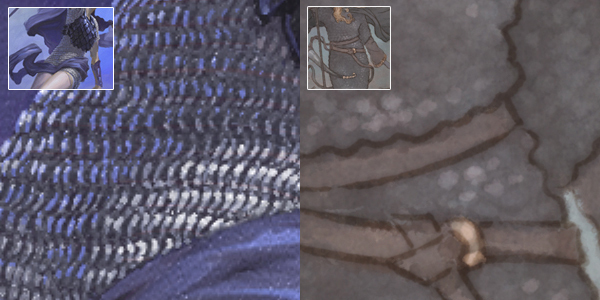 Back then, I was slavishly trying to render every detail, thinking that this would be impressive in and of itself (sometimes it can!). Four years on, I’m letting line suggest the outer form and just giving vague hints about the surface of the garment. I don’t know if one approach is necessarily better than the other, but I feel the way I am working now gives me much stronger results. Happily, the judges of the challenge felt the same way! 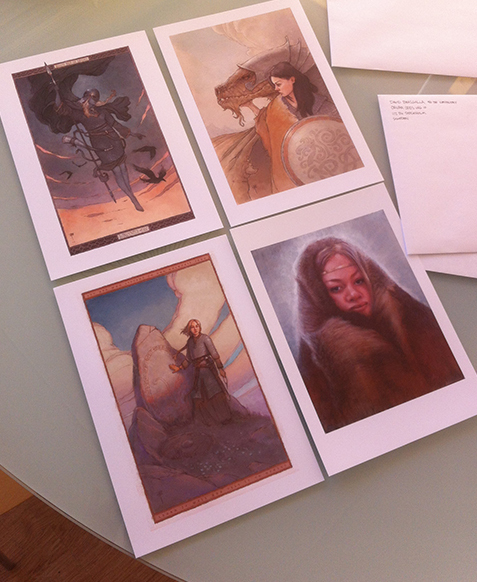 Thanks again to Jon, Irene Gallo, Lauren Panepinto, Julie Bell, Terryl Whitlatch, Terese Nielsen, and Rebecca Guay for their votes of confidence in my work – it means more than I can properly express. Dinotopia artist James Gurney often posts at his blog “Gurney Journey” about interesting light and atmospheric effects like sun pillars. I often see sun pillars here in Sweden in the summertime, but I took a photo of this rarer (for me) wintertime pillar back in winter 2011. 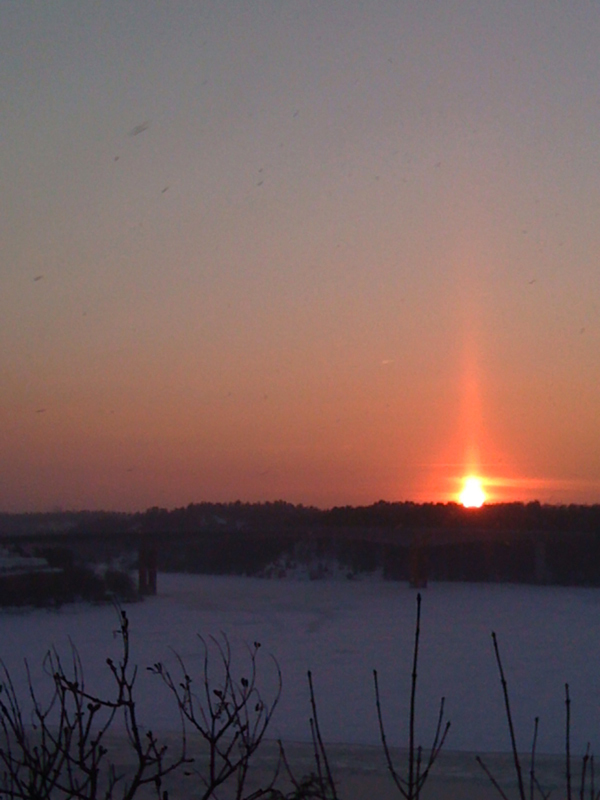 A winter sun pillar over Lake Mälaren in Stockholm. On the evening of December 2rd, 2012, my wife and I left our art studio and noticed a strange and ethereal shimmering quality in the very cold air. It was innumerable very tiny ice crystals… so fine that one couldn’t quite make them out without looking in just the right way. We looked out over the lake and saw pillars of light rising from the lights on the far shore. 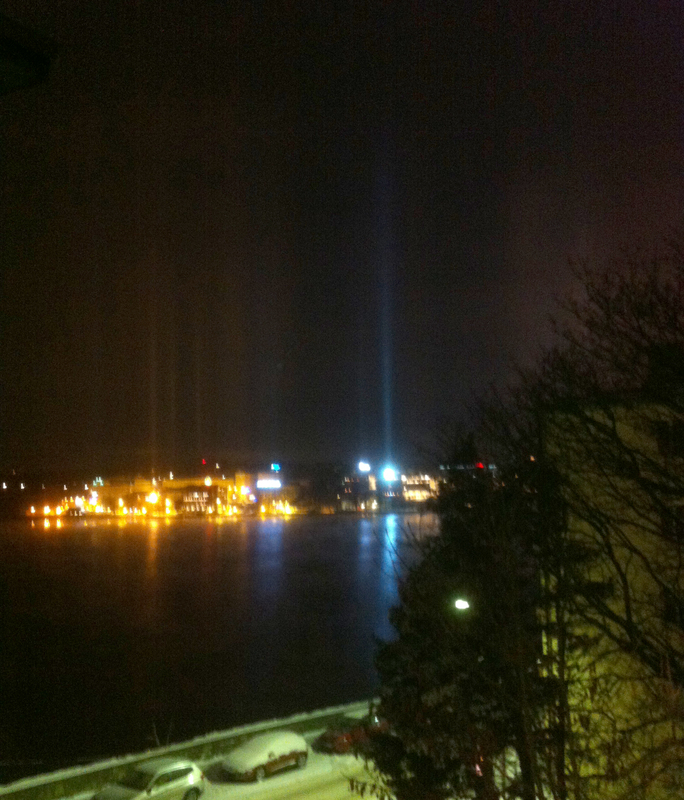 Light Pillars over Lake Mälaren, Dec. 2nd 2012. When we walked further down the street, I looked back, and now the lights were blocked by the row of flats facing the lake – but we could still see the pillars extending up from behind the buildings! 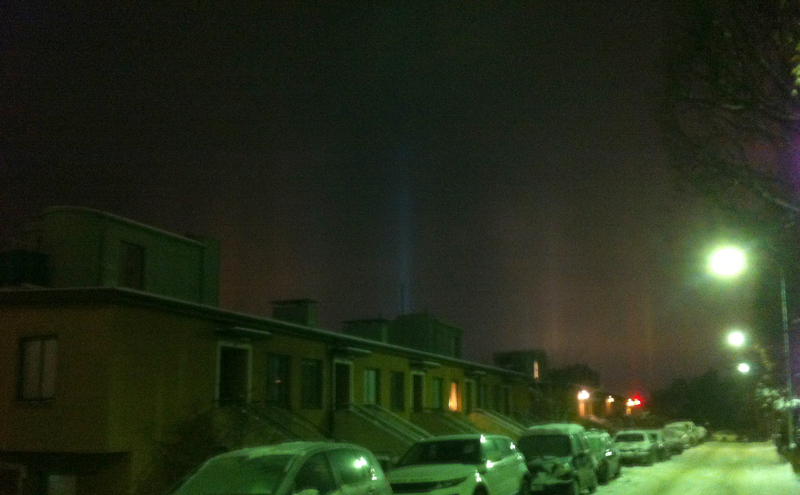 Light Pillars, Dec. 2nd 2012. 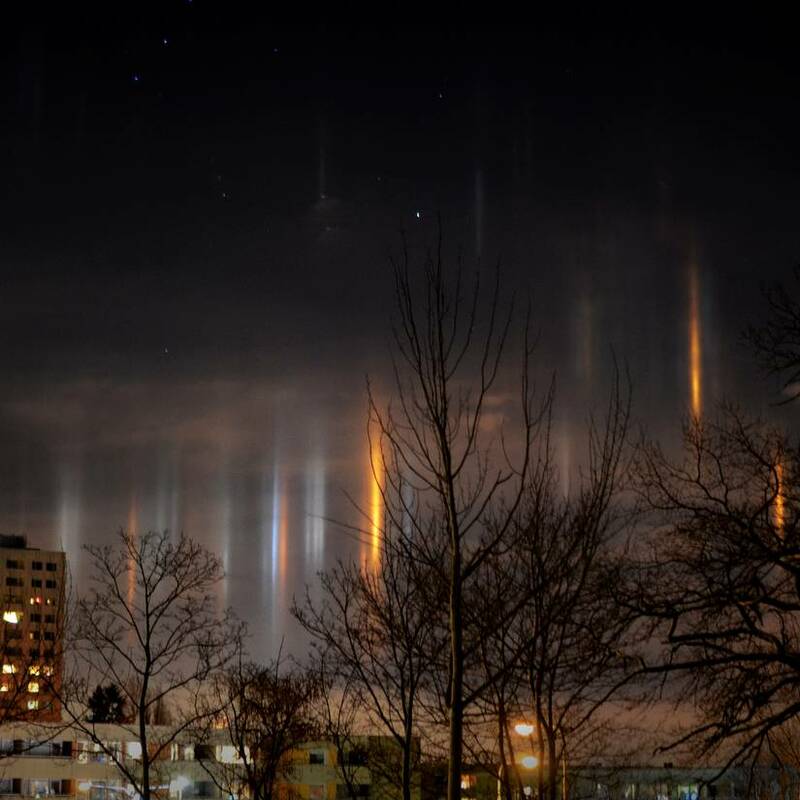 The next day, many people observed and took pictures of some glorious halo effects in the sky, but unless you were lucky enough to be out late on the evening of the 2nd, you may well have missed these strange and beautiful lights! Creative Iphoneography Registration is open! Marmalade Moon’s Creative iPhoneography Course is now open for registration! Kate England will be teaching this six-week, online workshop on how to “turn your iPhone into an exciting, powerful creative tool”. Kate gets gorgeous results with her iPhone camera on a daily basis, and her personalized instruction will show you how to also produce compelling and vivid imagery, as well as how to find new spaces in your day to be creative and inventive. The course begins on August 20th and it’s first-come, first-served – so don’t wait! Register your place today!